Theo Walcott scored two goals against Leicester on Wednesday. Photo by Agencies. Manchester City moved 15 points ahead of their nearest tittle opponents as they won convincingly at home and their rivals Manchester United lost on the same night. Arsenal now have an eight point deficit to cub on the fourth placd after suffering their second successive loss away from home as Liverpool won away to Huddersfield Town. The pressure on Chelsea manager Antonio Conte just increased and his side succumbed to a 3-0 home loss to lowly Bournemouth. Here is the finest group of 11 players that PML Daily Correspondent, Shaban Lubega picked from a host of stars that performed in game week 25. The eleven in a 3:5:2 formation. Nick Pope has continuously been been one of the stand out performers for Burnely this season as the Clarets continue to impress the neutrals and push for a European spot. The goalkeeper has conceded a mere 22 goals in 25 matches and against Newcastle on Wednesday, on top of putting his game reading abilities to work on several occasions and making some decent saves, he saved Joselu’s penalty in a period when Newcastle was all over his side and kept them in the game for long periods until they equalised with five minutes to go. The man that was thought to be on his way out of Spurs a few years ago due to the quality that was available in terms of competition now looks more of an established full back in a top team and keeping Serge Aurier on the bench. Tasked with the job of shutting out United’s marque signing Alexis Sanchez and he did it with alot of ease that he got even time to lay the cross Phil Jones deflected into his own goal for the second game. More of the same perfomances from the young Englishman will surely see him on the flight to Russia come June. Clucas scored his first brace as a Swansea player against Arsenal on Tuesday. The Englishman has been one of the revelations of the team under Carlos Carvalhal and he may be an integral piece in Swansea’s survival aspirations of he can keep himself in form. In such form, may be he will be in Gareth Southgate’s mind come the Russia world cup. 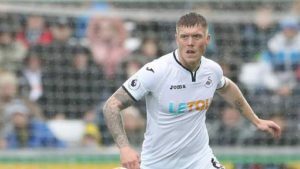 Carlos Carvalhal may be the catalyst to Swansea’s recent charge but having consistent performers like Alfie Mawson should always get the credit they deserve. Over the course of the last few weeks when Swansea has lost only one of its last seven games in all competitions, Mawson has been a rock at the back and against Arsenal, the Englishman did more than just defend as he played a through ball for Sam Clucas to equalise just after his side had conceded 70 seconds before. With some of England’s senior defenders lacking in form, Mawson will be fancying his chances of playing at the World cup but will of course looking to helping his beloved Swansea avoid the drop first. The boy who was deemed not good enough by Chelsea a few months ago and sold, came back to hunt Antonio Conte’s men at the Bridge on Wednesday. A master class defensively is what can be used to describe his perfomance when shutting out the likes of Edin Hazard and Pedro Rodriguez but what will always highlight his perfomance was the goal he scored against his former side. All he had to do was be in the right place at the right time and boy he was, poking home a Junior Stanislas purried shot on a day the his team put out their finest perfomance since 2015 when they joined the top tier. With Newcastle struggling and in danger of suffering back to back relegations from the Premier league, they need their senior players to start perfoming. The Magpies captain Jamal Lascelles put out such a perfomance against Brighton that he deserved to walk away with all three points when he put his side ahead mid way the second half only for his own keeper to score an own goal with five minutes to play. The Big Englishman may have little or no chances of impressing the national team coach for a place at the World Cup but if he can put out more perfomances close to the one on Wednesday, who knows what may be in store for him. Jurgen Klopp required a positive response from his side on Tuesday when they traveled to Huddersfield after loosing their last two games in all competitions, many did exectly that but non did so better than the versatile German international. The volley outside the box to amke it 1-0 was the tip of the ice but his general perfomance all night long as he martialed the midfield can also not go unnoticed. Can is highly tipped to be leaving at the end of the season but if his show at the John Smith stadium is what Liverpool are likely to miss when he is gone, then Klopp and his stuff better do all it take to keep him put. Alfie Mawson is surely knocking on the door for a spot in the World Cup. Photo by Agencies. The catalyst of Spurs’ excellent peromance against Manchester United on Wednesday, Christian Eriksen bearly put a foot wrong as his team out played their opponents in every sense of the word. Scored the fastest goal this season after only 11 seconds in the game but the way he dictated the tample of the match and his abilities to find his team mates in tight situations against one of the best teams in the land was his stand out contribution on a day that many Spur’s fans will not want to forget anytime soon. Argubly the best player in the league this season but he shows no signs of slowing down anytime soon. The Belgian made a a goal ans scored one himself against West Brom on Wednesday which he has gotten accustomed to this season. At 36 assists since the start of the 2015/16 season, De Bryne is the top creator in Europe a head of the likes of Ozil, Messi and Messi in that period. 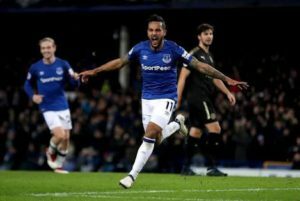 Theo Walcott made the move to Everton in a move to re-ignite his world cup hopes and he has surely hit the ground running with wonderful displays. The two goals against Leicester on Wednesday cuped a display that will get the National team coach thinking. If his goals did him a lot of favour, the team must also be delighted that he won them their second match in seven games and manager Sam Allerdyce will surely be backing on him for inspiration. The mastermind of the 3-0 hammering of Chelsea at Stamford bridge on Wednesday, Wilson did more than just score the first goal as he was a menace to the Blues defence all day long and in the process assisting Junior Stanslas for the Cherries second goal. Eddie Howe will surely be hoping his talisman can keep fit for a while and avoid the constant injuries that have affected him since Bournemouth joined the top tier in 2015. What a turn around the Portuguese has engineered at the Liberty stadium since his arrival. The win against Arsenal with his team coming from 1-0 down to win 3-1 was his fourth in seven matches and Swansea are finally out of the relegation zone for the first time in over four months. If he can somehow mastermind survival in South Wales, he will surely have punched more than his weight.